The Martians are coming! From producer George Pal's The War of the Worlds (1953). All the many tales of extraterrestrial invaders in twentieth- and twenty-first-century popular culture derive from a single common ancestor, the first great work on this theme, H. G. Wells' 1898 novel, The War of the Worlds. Whereas Wells wrote about Martians invading Victorian England and leveling London, various later adapters of his work have updated and altered its setting to reflect the concerns of their own time. Only a year before the start of World War II, Orson Welles' 1938 radio adaptation included fake news bulletins about the Martians landing in New Jersey; thinking the reports were real, many Americans panicked. Animator George Pal produced the 1953 film version, which reflected the tensions of the cold war. Steven Spielberg's 2005 blockbuster adaptation, which, like Welles', focuses on New Jersey, includes allusions to the September 11, 2001, terrorist attacks. Wells' War of the Worlds has also been adapted into comics, including a memorable issue of Classics Illustrated (#124, 1955). Writer Roy Thomas and artist Neal Adams conceived the basic ideas for Marvel's War of the Worlds series that debuted in Amazing Adventures #18 (1973). According to this series, Wells' Martians returned and conquered Earth in 2001. Like a futuristic Spartacus, Killraven, a warrior raised to fight as a gladiator, led a band of freedom fighters in battling the Martians. The series, soon retitled Killraven, is best remembered for the remarkable work by writer Don McGregor and artist P. Craig Russell. In the second volume of their comics series The League of Extraordinary Gentlemen (2002–2003), the British duo of writer Alan Moore and artist Kevin O'Neill depict their team of late Victorian heroes playing a role in Wells' War of the Worlds. But Wells' intelligent, octopus-like aliens are hardly the only kind of Martians in popular culture. Indeed, League includes appearances by Martian races from other authors' books, including Edgar Rice Burroughs' John Carter, Warlord of Mars series (1917–1943). DC Comics even has a Martian superhero, J'onn J'onzz, the Martian Manhunter, who debuted in Detective Comics #225 (1955) and appears regularly on Cartoon Network's Justice League (2001–2004) and Justice League Unlimited (2004–present). In both the original and contemporary backstories for the Martian Manhunter, there were a race of green-skinned Martians, to which J'onn belonged, and his enemies, the warlike White Martians. In the original continuity, the White Martians devastated their planet, and the surviving Martians abandoned their native world, later making an unsuccessful effort to invade Earth. In the revised continuity, most Green Martians perished ages ago, but the White Martians survived in another dimension. In 1997 and 2000 the White Martians twice attempted to conquer Earth; Superman subsequently banished them into the Phantom Zone. 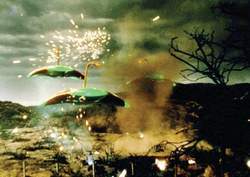 There are even comedic versions of Martian invaders, including the gnomish creatures in Tim Burton's film Mars Attacks! (1996) and Chuck Jones's Marvin the Martian, nemesis of Bugs Bunny and Daffy Duck (in his Duck Dodgers persona). Aliens also invaded the movies, including the creature from Howard Hawks' film The Thing from Another World (1951), the righteous Klaatu from The Day the Earth Stood Still (1951), the “pod people” from Invasion of the Body Snatchers (first filmed in 1956; remade in 1976 and 1993), the title creatures from Twentieth Century Fox's Alien franchise (starting in 1979), and the unnamed race of alien invaders in director Roland Emmerich's Independence Day (1996). In television's The Invaders (1967–1968) and The X-Files (1993–2002), the heroes attempt in vain to warn the populace about the alien invaders in their midst. In the original Battlestar Galactica (1978–1979) and its 2003 revival, both set in the future, the alien Cylons seek to wipe out the remaining humans in the galaxy. In its many incarnations (beginning in 1966), Star Trek has introduced numerous alien races that have opposed Earth, including the Klingons, Romulans, Cardassians, and the Dominion. The most formidable of these races is the Borg, which actually consists of members of many humanoid races, all of whom have been converted into half-robotic cyborgs, thereby forcibly “assimilated” into a collective with a group mind, bent on conquest. Another comedy treatment of the alien invader theme is Men in Black, which originated as a comic book (1990) before being adapted into movies (1997, 2002) and television animation of the same name (1997–2001). Here “alien” invaders from space are presented as if they were alien immigrants from abroad: most of them are peacefully trying to assimilate into American society, while a few prove to be threats to national—and planetary—security. Stan Lee and Jack Kirby co-created two great galactic empires for the Marvel Universe. The first is that of the Skrulls, reptilian shapeshifters who first appeared in Fantastic Four #2 (1962). Like aliens in many other works, such as The X-Files, the Skrulls can impersonate human beings and thereby infiltrate Earth's population. The other empire is that of the Kree, humanoids whose skin color is either blue or pink, resembling Earth's Caucasians. The Fantastic Four first ran afoul of the Kree when they defeated a giant robot Sentry, which the Kree had stationed on Earth (Fantastic Four #64, July 1967). In retaliation, the Supreme Intelligence, a composite of the greatest minds in Kree history, dispatched his chief enforcer, Ronan the Accuser, to punish them (Fantastic Four #65, August 1967), but the Fantastic Four overcame him. Then the Kree sent a military officer, Captain Mar-Vell, created by Lee and artist Gene Colan in Marvel Super-Heroes #12 (December 1967), to spy on Earth, but this new “Captain Marvel” ended up siding with the Earthlings. Writer Roy Thomas then staged a war between the two empires, with Earth and its superheroes caught in the middle. Primarily illustrated by Neal Adams, the Kree-Skrull War (in Avengers #89–#97, 1971–1972) remains one of the greatest epics in Marvel history. Other malevolent Marvel aliens include the reptile-like Badoon (introduced in Silver Surfer #2, 1968), the insect-like Brood (who debuted in Uncanny X-Men #155, 1982), and the Borg-like Phalanx (who first appeared in Uncanny X-Men #311, 1994). The DC Universe also has an assortment of dangerous aliens. The Weaponers of Qward, created by John Broome and Gil Kane in Green Lantern #2 (1960), inhabited an antimatter universe; their warriors hurled energy weapons resembling golden thunderbolts. Inspired by the 1940s superhero created by Joe Simon and Jack Kirby, the Manhunters (from First Issue Special #5, 1975) are androids created by the benevolent Guardians of the Universe to battle injustice; after the Manhunters rebelled, the Guardians instituted the Green Lantern Corps instead. The Dominators (from Adventure Comics #361, 1967) are cunning strategists, the Gordanians (from Green Lantern #142, 1981) are infamous slavers, the militaristic Khunds (from Adventure Comics #346, 1966) build their culture around warfare, and the Psions (who originated, oddly, in Witching Hour #13, 1971) perform amoral scientific experiments. There have been some particularly unusual twists on the alien invasion theme. In both an episode of television's The Outer Limits (1963–1965) and comics' Watchmen (1986–1987), an alien invasion is faked to prevent a nuclear war on Earth. Alien invaders also haunted many episodes of television's original Twilight Zone (1959–1964), but one episode, “The Invaders,” demonstrates that from the perspective of the denizens of other worlds, humankind are the alien invaders. They seemed to be holding a council, for he could hear them talking excitedly in the detested tongue of the alien invader. He's recruited by Judi Dench's ethereal ambassador to protect Helion Prime from alien invaders. Some subjects explored includes dissociative identity disorder in horror films, mentally ill mobsters, CotardAEs Syndrome and alien invaders, Edgar Allan PoeAEs unreliable narrators, and Kurt CobainAEs suicide. ALIEN invaders have certainly changed a lot since the old 1950s sci-fi movies. When Matthew's writer friend and his wife discover a small, featureless body, they realise human beings are being assimilated by a race of alien invaders. It continues in 'The Flash,' where alien invaders, the Dominators, make their presence known to the heroic conglomerate, which now includes Green Arrow (Stephen Amell), his crew of athletic crimefighters, and the time-traveling Legends. It sees the US Navy battle to save the Earth from alien invaders. The women, Catchers, restrain and cage the children, and the men, Mappers, are mapping the town for the alien invaders. Asa Butterfield plays the shy kid who must save mankind from alien invaders, the Formics. Its young protagonist and narrator is instantly compelling from page one and reader affection only grows stronger as sixteen-year-old Randy Knox embarks on some of the greatest battles of his time, against alien invaders who have decimated mankind. 99) In the year 3000, man is an endangered species at the mercy of a space-plundering race of alien invaders. Ultraman Volume 2 continues the modern-day manga (Japanese comics) successor series to the original Ultraman story about a man who assumed incredible powers to battle gigantic alien invaders.